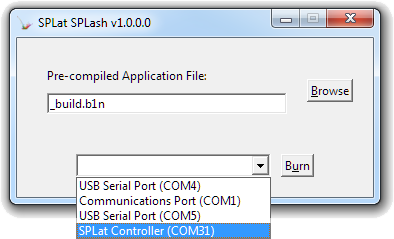 SPLash is a utility that allows someone with minimal training to download a translated SPLat program to a controller. It is designed to allow OEM users of SPLat (i.e. someone embedding a SPLat in their own product) to distribute SPLatWare updates to their customers. SPLash will download translated files with the file extension .b1n (or .B1N). Note that the middle character is a numeral 1. This was selected in preference to .BIN because the latter is quite widely used, so we have tried to avoid conflicts with any other programs. SPLat/PC versions 7.19.4 and later will generate a .b1n file when you Translate a program. Older versions generate a .BIN file. You can either re-translate or re-name the file. You can download SPLash from our SPLash support page online. Note this program is not required for the HMI family. For the HMI you simply drag and drop the the .b1n file into the System Firmware folder. No special PC application is required. Note though that image and font files are not part of the .b1n file. These files need to be placed in the Internal Storage folder. You should do several rehearsals of this procedure, including the parts your customer must do, before attempting to teach your customer. Translate the program and generate a .b1n file. In SPLat/PC, click File | Save. A bunch of files will appear in your .bld/.spt folder, one of them is the .b1n file. Either email the program to your customer or make it accessible online. Get your customer to download and run SPLash. Either click Browse or drag 'n drop a .b1n file onto the SPLash window. Instruct your customer how to electrically connect to the SPLat board. This must be done in a safe manner! Choose the COM port then click Burn. You may need to do this within 10 seconds of powering the controller. Note: We cannot provide support to your customers. You must educate yourself in the process before trying to teach your customer.